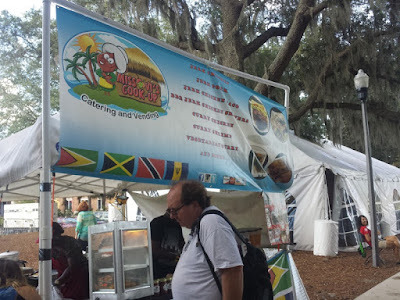 I tried food from Miss Vi's Cook-Up a few weeks ago during the Orlando Fringe Festival. They were set up in Loch Haven Park as one of the festival's food vendors serving Caribbean foods. Of the nearby vendors in the area, Miss Vi's food smelled the most delicious making my decision to eat there easy. 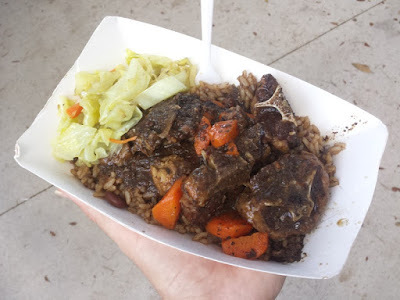 I tried the Oxtail. The meat was stewed with carrots and served over rice & peas. Cabbage was served on the side. The oxtail was nice and tender, with the meat easily falling right off the bone. The jerk sauce had a very nice flavor with added to the rice below. I did enjoy the oxtail. It was a little messy to eat with the bones in a festival environment, but it was otherwise delicious!